Providing proper maintenance to your wrought iron fence can really help it to shine! Wrought iron fences are known for being durable, but they will require care to function properly. Wrought iron fences are known to last for decades, but rust can vastly shorten your fence’s lifespan. With proper maintenance, however, you will be able to keep its aesthetic appeal and structural durability intact. 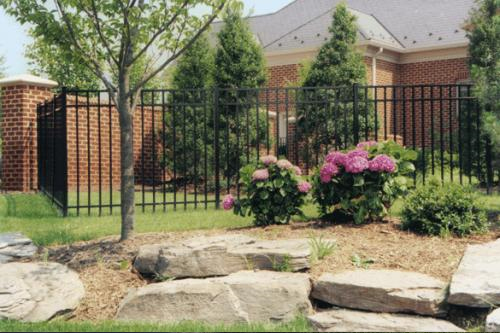 Let’s take a look at the proper ways to care for your wrought iron fence. Aesthetically, wrought iron fences can look worn down when vines, grass, or weeds start growing onto the fence. The longer you let this vegetation grow around your fence, the harder it will be to remove it and clean stains. In order to avoid that, take the time to over the surrounding areas around your fence with a tarp. You can use a wire brush to remove any evidence of rust from your wrought iron fence, but not any old brush is going to work. You will want to use a fine wire brush, as a heavy corded wire brush will ruin the integrity of your fence. After you have removed the rust, use a non-ionic detergent and water to rinse any remaining remnants off. Then, allow your fence to dry. If there is already a lot of rust on your wrought iron fence, apply a rust converter to the affected areas. Tannic-acid-based converters or phosphoric-acid-based converters are most appropriate, but make sure to follow all manufacturer instructions explicitly. Also, make sure to wear all of the required protective equipment. After you’ve used the rust converter, you can then apply a thin coat of primer. Primer should be oil-based and made specifically for metal applications. Spray-on primers are a lot easier to apply and will get into the crevices of ornamental designs easier than brush-on applications. Apply a coat of an oil-based paint on your wrought iron fence that is designed for metal, and you are almost done! If you want to match your paint with the color of your wrought iron fence perfectly, make sure to get in touch with the manufacturer to see if a touch-up paint is available. To maintain your fence, make sure to clean it with soap and water once every six months. You can also apply a thin layer of metal-grade wax to the outside of the fence. This helps protects areas that are exposed to vegetation and sprinklers. This entry was posted on Friday, April 8th, 2016 at 6:26 pm. Both comments and pings are currently closed.